It’s a bit of a significant day in Casa de Cooker. Today the Little Sister is 2 years, 11 months and 3 weeks; the exact age the Big Sister was when she became the Big Sister. The day started with cuddles in bed. I explained what today was and I had a quiet talk with the Big Sister. Looking back, I expected a lot from her at just two years old, so I told her what a great job she’d done. I explained how I would ask her to fetch wipes, nappies and towels that were just out of reach of the baby bath. I thanked her for always wanting to be helpful. I told her how I often had to look after the Little Sister first and she had to wait. I thanked her for being patient. I remembered how she would race into my bathroom while I showered to let me know that the Little Sister had woken and was crying. I thanked her for always having her sister’s interests at heart. 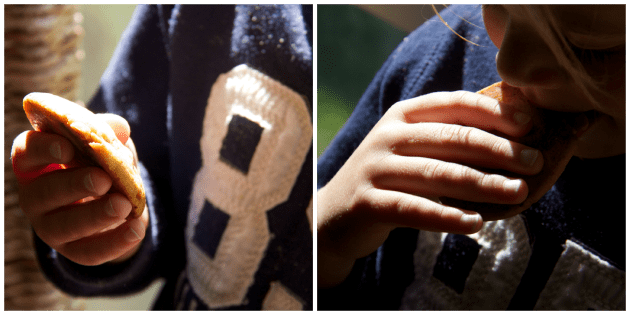 I reminisced that I never had to worry that she would hurt her little sister – accidentally or on purpose. I thanked her for being careful and thoughtful beyond her young years. I feel teary writing this. The Big Sister has been my little mate since the beginning. I have no idea what I did to deserve such a considerate and clever little offsider but her beautiful disposition has made such a difference to my happiness as a mother. I’m a very lucky bird. We’re at home alone today. This morning we did a yoga class together and this afternoon we’re baking biscuits made with chocolate covered honeycomb. The biscuits are her idea actually. This morning she was musing from the backseat about what chocolate and honey would taste like together. 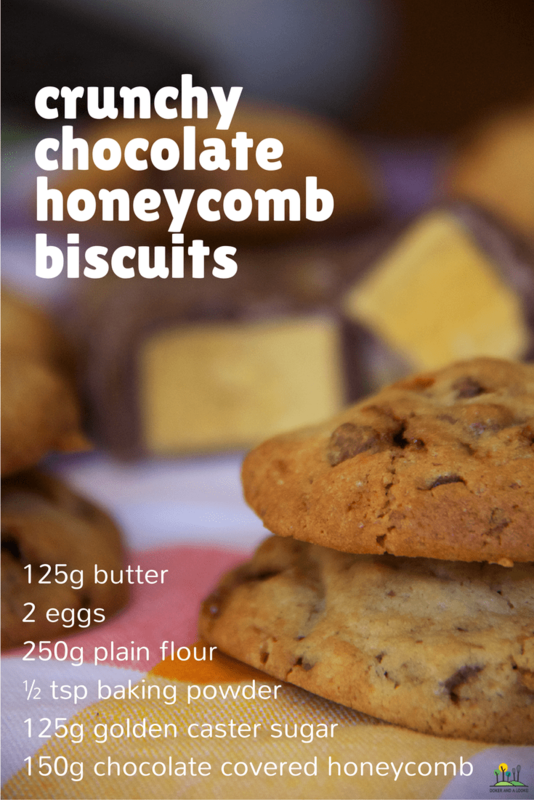 I figured there was no need to wonder, we could spend the afternoon baking crunchy chocolate honeycomb biscuits. First, the fun bit! Place the choc honeycomb in a plastic bag. Wrap the bag in a tea towel and smash the bag with a rolling pin until the pieces splinter into honeycomb shards. Cream together the butter and caster sugar. Add the eggs, one by one, beating between eggs. Then add the flour and baking powder and mix until combined. Add the choc honeycomb pieces and mix until combined. Add tablespoon sized balls of biscuit dough and bake at 160ºC for 12 – 15 minutes or until the biscuits are golden. Remove and cool on racks. Makes two dozen. If you’re lucky enough to have a super little sous chef, share one with her while they’re still warm. I’ve been studying the Little Sister leading up to today. 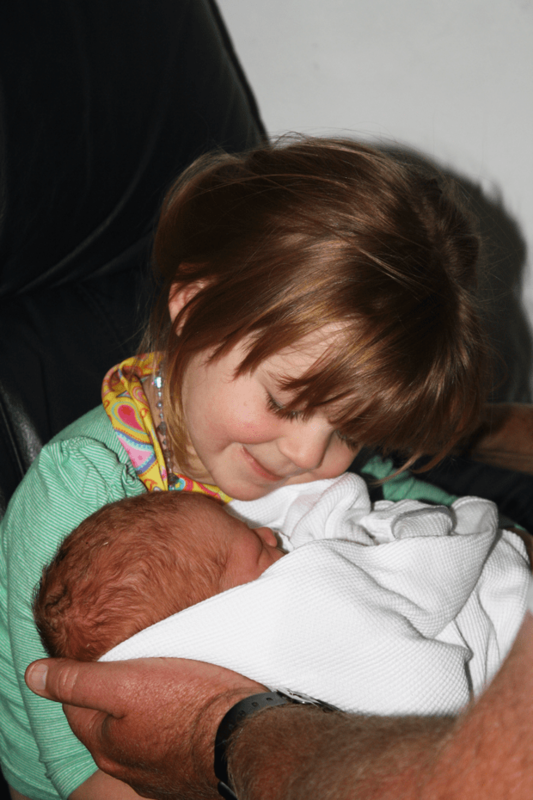 Was the Big Sister really that tiny when I bought our second baby home? I remember coming home and being astounded at how big her night nappies were. Something changed in the days since I’d left for hospital. The Big Sister seemed enormous at 2 years, 11 months and 3 weeks. At the same age, the Little Sister seems still a baby. I feel guilty that I expected so much of the Big Sister, but a day of yoga and biscuits will square us away. Right? do you think birth order plays a role in personality? Raspberry drinks + honeycomb biscuits = absolved of our sins Em! I don’t have kids but loved reading this post! You must be so proud of your Big girl! And the cookies, I’m adding to my list to bake. You got me teary! Beautiful post, Amanda. You know, even though there’s only 2 mins difference between my boys, N instinctively knows his big brother role. It’s beautiful to watch. As for the biscuits…OMG, how I LOVE chocolate honeycomb! I have both big and little gaps between my kids and they all work really. A lovely bday morning of reminiscing! These sound all sorts of awesome. Yum! My youngest was born two days short of two years after her sister. Thier older brother was almost 19! Funny how much we ask of our oldest son compared to our youngest son! Our first two are only 17 months apart and then all of our others are 3 years apart. Oh yum think I’ll make those biscuits this weekend…even though I didn’t know that golden caster sugar existed…!! I have 18 months between 1 and 2, 18 months between 2 and 3, 3 years between 3 and 4 and 3 and a half years between 4 and 5….. When I think back to having a three year old, and eighteen month old and a newborn I can’t believe we survived!!!! !